Students finished up their time in the Art Room with me this semester. To finish off the class, students worked on their Final Challenge and Exam this week. In order to get ready for the Exam, students were given a review guide and some went beyond just filling it out to create a guide to help them study. The day before exams stared, students were asked to come up with two questions based on their review. Then, after breaking into two teams, students played "Stump the Student." The first team action is for students to pick their team names. I required students to use "artful" names and some of my favorites from the day are "McWarhols," "Chick-fil-Art," The Chuck Closers," and "Chuck Far Away." The rules for the review game are simple: students are placed on two teams to go head-to-head, asking their opponent a question based on the review. They may use images or other props to help visualize their question and they must know the answer to what they are asking. If the student being asked gets the question right, their team gets the point. If they are stumped, then the student who is asking the question gets it right if they know the answer. Then roles change before two new students are up. It can be an intense game, so ground rules of behavior are also set before we begin to ensure it is fair and all benefit from the question/answer to help them review for their exam. I started doing this a few years ago and enjoy it beyond any other review activity I have tried prior or since. For the Exam, students were asked a series of questions that covered the bulk of concepts they learned from this year. From identifying basic color groupings in famous works, to ordering the stages of clay, and labeling the parts of an image structure, students were tasked with being accountable for the terms and concepts they were taught over the last 18 weeks. The best part of this is that Schoology grades it for me, so students and I receive immediate feedback on how they did and what could be improved upon. In addition to that, they also had to create a GIF using a work from one of our elementary or intermediate art students. I have Ian Sands to thank for this idea. This is one of my favorite things to do to end the term because it gives kids one more tool set before they leave and they get to use that to create something using another BCPS student's work. Thanks to DonorsChoose and the amazing support of those who gave, we now have the makings of a Lego Wall over by the STEM classroom! I am very excited to get kids involved with making art on this and have Tricia Fuglestad to thank for sharing various Lego Art Lessons on her blog. One project I hope to adapt for our wall is this one on Rotational Symmetry. It is a great opportunity to showcase STEAM in action, especially since the work will be in a public space. I also think this work, using students as models for character traits is a great way to use Lego to connect concepts to the classroom. The STEM teacher and I are working on a few ideas in hopes we will have a solid plan by 4th marking period. If you are interested in building your own lego wall, here is where I drew inspiration before getting my project organized on DonorsChoose. It took me about a year of thinking about this before I went to action on it. I started by talking to our building leadership and the STEM teacher, who were on board from the beginning. Then I created the project on DonorsChoose, which ended up being funded by the end of first semester. Finally the boards were installed days after getting the shipment. It has been really exciting project to have funded and one that has gotten a lot of positive reactions from students. The fist pumps and excited smiles alone have made it a success. To finish out the term, I also had students fill out an exit survey. I use this for a few things. I use it as a point of data to reflect on my effectiveness as a teacher and if we met the goals set; I also use it as a way to make improvements and adjustments for the future. It is a nice way to end the class, especially reading the responses I got to what was the best thing we did and anything else they think I needed to know. I had a great first half of the school year and know that this next week with a new group will make way for a great way to finish it out! Students worked on remixing their past works into new works this week, using either new compositions, materials, or skills to demonstrate their art understandings. In addition to using materials from the past, students experimented with some new ideas and took time to get feedback on their works using a peer critique method. Because of a small disruption in the week of an ice day, not everyone's work was handed in as scheduled. I look forward to when the rest come in on Monday and getting this class wrapped up for the semester next week! Trever O.: This piece was a remix of my old work that was my fish piece from 5th grade called Water Color Fish Painting. I kept the outline of the plants and environment similar and copied it four times. I changed the color scheme for each frame from the original. I used Andy Warhol’s idea of copying each frame and coloring it different with a color scheme for each. I changed it by rather having what seemed to be a blue background with a different color I used complimentary colors. I chose this piece because I was really interested in doing a block print piece. Trever W.: I used the abstract of everyday objects. one similarity is the lies that divide the sections of color. I choose to remix this art piece because I thought it would be fun to use the colors in a way that I do not use a lot. One difference is the heart is in the middle of the new one and not the old one. Kristina B.: I chose to remix a project that I did from earlier this year for a photoshop challenge. Comparing these two, this project I did the whole screen instead of just my face to add more of an effect to your eyes. The same thing that I did with both projects is I used photoshop and did an image of my face facing the other way each time. I chose to remix this project because I felt that I could improve it and make it more appealing when people look at it. What I did to change this piece was to do the whole screen instead of just my face. On Thursday, we had an ice day. Instead of wasting away in front of the TV, I took the time to make these beauties for my new Schoology courses next semester. We are changing to the enterprise version of the website, so I am learning new things and needed more colored cans for each of my sections. Before I made these, I was feeling anxious about the change. I still feel anxious, but not nearly as much. Going to the Meijer Gardens later in the day to see some of the new Ai WeiWei exhibit also helped. Next week is the LAST week of the semester before we start over again with a new group. I am really proud of what has been accomplished so far and I am excited to see what is ahead of us as we finish out this semester and begin a new one. Coming back from a break can be hard. I need just as much easing into it as my students. Instead of starting out with a new project right away, I decided that I would use that first day back as a way for students to reflect on all they have accomplished by GAP-ing their portfolios. 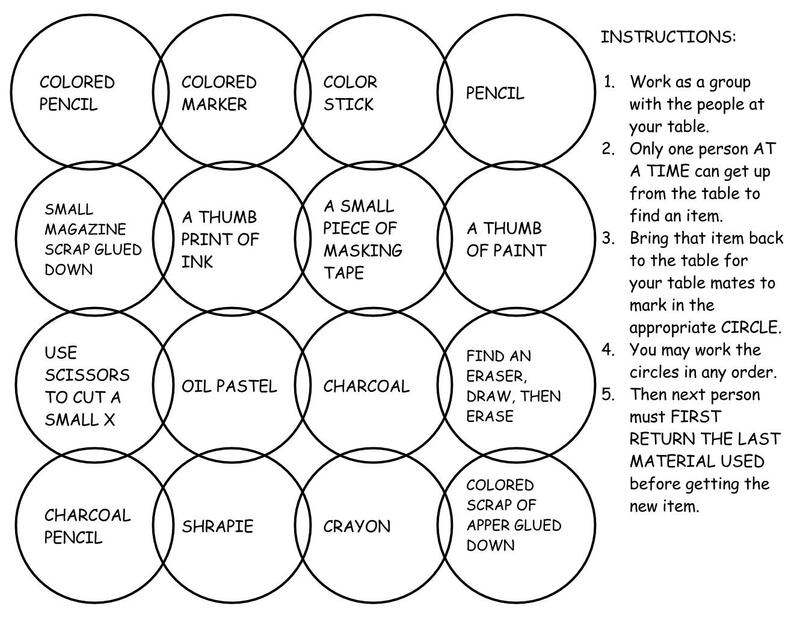 I also wrote this activity for the MAEIA project and you can find the more detailed step-by-step instructions on their website. What is GAP? It stands for Good, Average Poor. Students simply empty the contents of their portfolios (which is also great because I get things returned to me that have been hiding away in there) and sort their work into piles based on their assessment of the work. Before we GAP, students write down the 4 C's (Creativity, Craftsmanship, Content, and Composition) in their sketchbooks and how we use the 4 C's to evaluate work. Here is a great video, too. Once we discuss how we determine what is "good" art, with an understanding that everyone has a different idea of "good" and that is okay, students start to sort. After about five minutes of sorting, they determine which work was the most successful and which was the least and then put all works, other than those two, away. Afterwards, students wrote down characteristics of their works using a Venn Diagram to compare and contrast and then we did a gallery walk before putting them away. This was also the time where I selected several works for upcoming shows and displays. This activity is one that I have done with students since I learned it from my mentor teacher, Jean TerMeer, at Corunna Middle School back in 2004. It is great for getting students to think critically about what they have made in the hopes they will use that thinking again as they continue to make future work. For our last challenge of the semester and of the class, students are being asked to use the idea of remixing and apply it to their work. Students watched the video above and viewed work by Kehinde Whiley before planning out remixes from their own portfolios, using Artsonia Classroom mode to look back years and years ago. Student work will be finished just in time to start reviewing for exams next week! View some progress below. Kendall College of Art and Design of Ferris State University announced the 2017 West Central Michigan Regional Scholastic Art winners this week. Once again, BCPS Visual Arts students were able to shine and earn the recognition in the various categories offered in the competition. I am excited that WMS had 30 winners across 12 different categories this year. It was also exciting that two of the works that won were printed on the 3D printer! The high school had 47 works that earned recognition, with one placing as an American Vision Nominee!